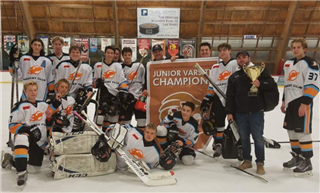 The Pacific Ridge Hockey Club took to the ice over the Thanksgiving break for the Annual JSerra Ice Hockey Tournament. The JV club team notched 5 wins and earned their second tournament championship of the year. The Varsity club team came away with a 1 and 3 record playing against stiff competition from the Winnipeg High School League. The step up in competition was a great experience for the club according to Head Coach Juan Trevino. All Firebird fans are invited to the next varsity home game on December 3 at 6:20 p.m.